The upcoming downloadable story content for DmC picks up right where the game finishes, so needless to say this will be one spoiler filled preview. At the end of DmC, Dante plunges his sword into Vergil and nearly kills the misguided brother. Vergil is spared, but he's left battered, bruised, and lost in a new realm that's closer to that of a hell-like dimension compared to the limbo areas that players went through as Dante. Not only is Vergil badly hurt and lost in an unknown dimension, but he's also lost the amulet he was given by his parents, thus losing a good portion of his powers. I went hands-on with just the first level of the new downloadable content, and it begins with Vergil being transported to the house he grew up in as a child. Don't worry though, you'll be exploring new environments and you quickly discover this isn't just a repeat level from the main story. In fact, areas in general have a more abstract feel to them, similar to the secret areas and challenge rooms as Ninja Theory wanted to do a slight shift in tone with this content. Plus cutscenes are all more like a motion comic crossed with an anime now, as opposed to in-game animations like before. 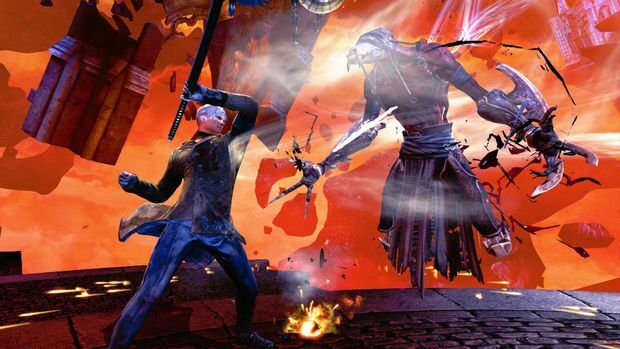 Combat wise, at its core Vergil has the same basic traits as Dante. He has his main sword attack, a projectile sword attack, plus his Angel and Demon sword attacks. All of this will be upgradable the same way as Dante, just not as deep and with less weaponry. He won't have access to his Angel and Demon attacks at first, but he is able to use their pull moves and that's where you'll see the biggest difference between to two brothers. Vergil will teleport for his dodges, and his pull moves. It's quite jarring at first, especially after you got so used to the way Dante did it. With Vergil, he's able to teleport enemies to himself, or he can teleport right to them. The same goes for when you're using Angel or Demon pulls on platforms. As for the story, you're playing as a very disheveled Vergil. Downfall aims to wrap up the story between the brothers as Vergil tries to make sense of what went wrong. Vergil doesn't think he's a bad guy, he was trying to do what was best for humanity. Dante will be making appearances in Vergil's Downfall, but it doesn't look like it's actually the savoir of humanity. 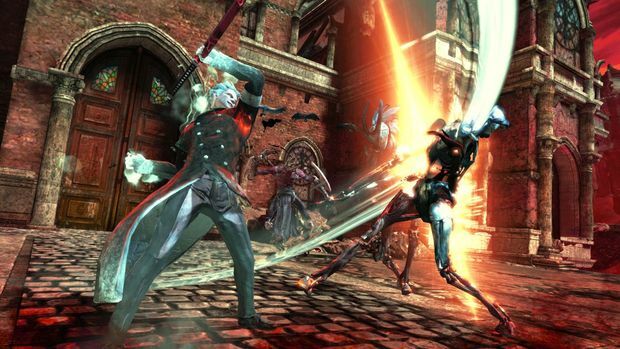 This hell-like dimension appears to be screwing with Vergil, and after a little challenging fight with a new enemy type, Vergil is stabbed once again by what I'm guessing to be a Dante imposter. Or maybe it's all in Vergil's head? We'll know for sure when the new content is released later this month.